We have good new for those who are little volatile in nature, such as who used to forget his passwords and put himself or even his system, database etc in danger. Those who intend to lose or forgot our Mysql database password need not to worry beacuse now you have MysqlPasswordAuditor which can help you in recovering it easily. It can also help you to audit Mysql database server setup in an corporate environment by discovering the weak password configurations. This makes it one of the must have tool for IT administrators & Penetration Testers. MysqlPasswordAuditor is very easy to use with the simple dictionary based password recovery method. By default it includes small password list file, however you can find more password dictionary files at OpenWall collection. You can also use tools like Crunch, Cupp to generate custom password list files on your own and then use it with MysqlPasswordAuditor. 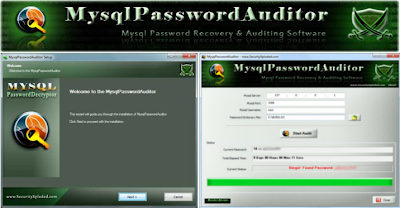 Free and Simple software to Recover/Audit Mysql Password. Detailed statistics such as tested passwords, elapsed time, progress bar is displayed during Audit operation.